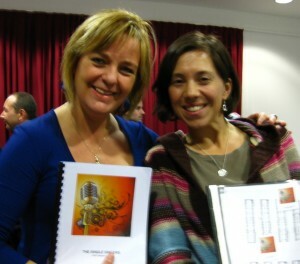 The Single Singers was originally created for the London A Cappella Festival in January 2012. Its founders, Annemarie Homan and Emily May ‘t Hoen, started the group as a way to give singers that were coming to the festival on their own the opportunity to actually perform in a group. The name was a twist on the renowned Swingle Singers, who were also the hosts of the festival. After a social meet-and-greet and just two rehearsals, this international line-up of 24 singers put together five songs, which they performed for the first and only time on January 14. Such a success was this endeavor, that the brand of The Single Singers has spread all the way “across the pond” to the United States! A fantastic idea! Well done Annemarie and Emily! In today’s a cappella world filled with cameradery and audience interaction it is only fitting that the great singers who come to learn and show appreciation at festivals get a chance to express their elation the way they know best…. Singing! I definitely want to be part of this if I happen to travel without my choir! Rock da house Single Singers!